This morning was busy in the labour room with five babies being born before midday. The layout of this area is strikingly different from the standard maternity suite in a New Zealand hospital. The room is one open space with eight curtained beds housed in two bays. Perhaps most surprising to me was that it is normal and expected that women birth alone here without any family or partner support. This included women coping with the delivery of babies with very poor, terminal prognoses such as one woman with an anencephalic foetus who was being induced at 41 weeks. Termination of pregnancy is illegal here is this highly religious country (Buddhists being the majority but there are also large Hindu and Muslim populations) as life is considered sacrosanct. The only legal grounds upon which a termination is allowed is in life-saving circumstances. This leads to difficult ethical situations for the consultants. Last week there was a woman on the ward who was in the early stages of pregnancy after being sexually assaulted and who was suffering from a catatonic form of depression, catheterised and nonverbal. There were many debates about the best form of management for her, as termination to prevent or treat maternal mental harm is illegal. To make the situation worse, the woman’s husband had expelled her from the family home due to the shame. This legal situation means that the indications for foetal ultrasound screening in early pregnancy are different to New Zealand and not all Sri Lankan women will access this during their pregnancy especially if they cannot afford to pay privately. Access to other technology can also be limited to those who can afford it. On one occasion the consultant recommended that a patient consider paying for pre-implantation genetic diagnosis for her next pregnancy due to her carrying her second foetus with polycystic kidney disease, a condition that had killed her first child in the neonatal period. Despite the cost associated with some aspects of care Sri Lanka has some of the best maternal outcomes particularly in Asia where the maternal mortality rate in 2013 in neighbouring India was 189 maternal deaths per 100 000 live births and in Nepal the rate was even higher at 291 per 100 000. 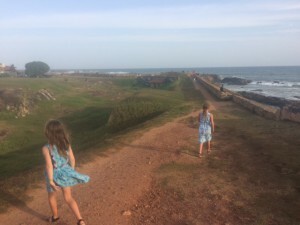 Researchers have attributed Sri Lanka’s low rate of 32 maternal deaths per 100 000 live births to the skill of the health professionals attending the births, an emphasis in government policy upon good maternal care and a relatively accessible free public health care system. On this particular morning I was privileged to observe and assist a skilled local midwife with the births of two women I had met earlier in the week. This experience gave me some of the nicest moments I’ve had since my placement started here. As a mother myself it feels very special to connect with another woman over the birth of their child. 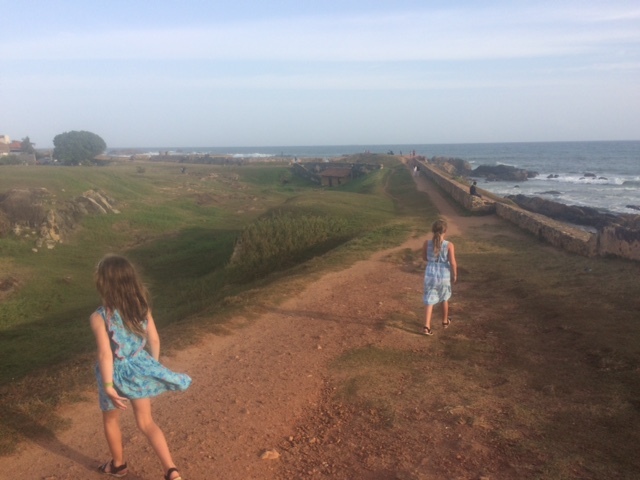 Ursula's two daughters walking at sunset along galle fort.